Greenhouse gas emissions from energy use are lower in Norway than in many other countries, because Norwegian electricity production is renewable and electricity accounts for a higher share of final energy consumption in Norway than elsewhere. Norway’s greenhouse gas emissions totalled 53.9 million tonnes CO2 equivalents (CO2-eq) in 2015, more than in 1990, when the total was 51.9 million tonnes CO2-eq. Emissions from final energy consumption made up 32.2 million tonnes CO2-eq. The remainder originates from energy production, including oil and gas production (15.1 million tonnes CO2-eq) and refining (2 million tonnes CO2-eq) and other activities. Emissions from energy use for energy purposes made up 20.7 million tonnes CO2-eq in 2015 (see the box on process emissions). In the period 1990–2015, final energy consumption including non-energy use rose by more than 15 %, but the associated emissions dropped by more than 16 %, to 32.2 million tonnes CO2-eq in 2015. 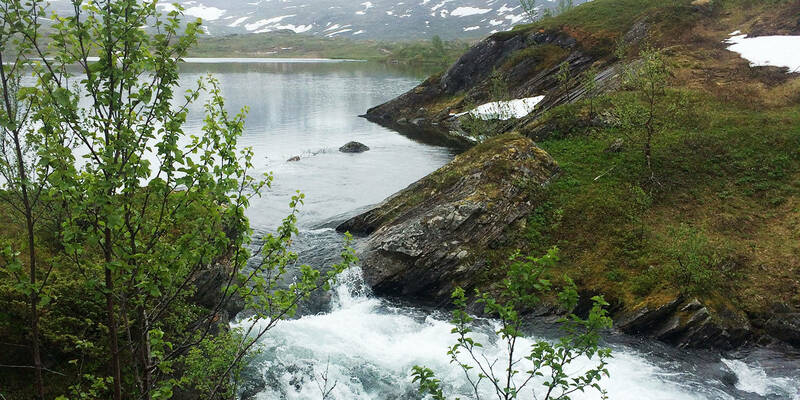 This means that emission intensity (emissions per unit of energy used) has been reduced by more than 28 % since 1990, reflecting changes in the energy mix in Norway. Consumption of low-emission and carbon-neutral energy carriers, including electricity, district heating and bioenergy, has remained stable or increased. Switching away from fossil energy sources to electricity improves the efficiency of energy use (because energy conversion efficiency is higher for electricity) and also results in lower emissions. In addition, there have been changes in the fossil fuel mix. Consumption of coal, coke and the heaviest petroleum products has been decreasing, while consumption of natural gas and diesel has been increasing. Because petroleum products make up such a large proportion of energy use, greenhouse gas emissions from energy use are higher in the transport sector than in many other sectors of the Norwegian economy. 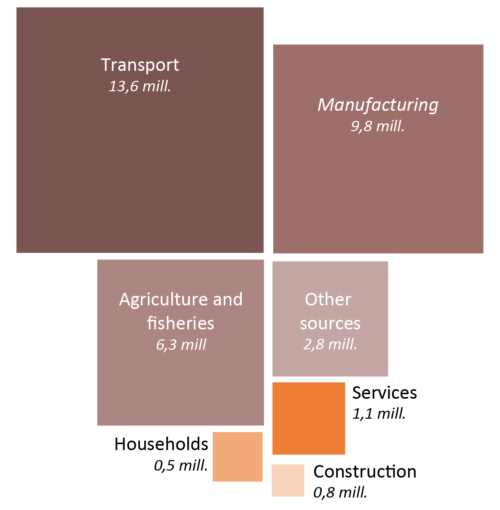 Transport accounts for a larger volume of emissions than any other sector, followed by manufacturing, as can be seen in the figure above. In 2015, emissions from the transport sector totalled 13.6 million tonnes CO2-eq, which is 26 % higher than in 1990. However, there have been improvements in energy efficiency. Energy use and emissions have levelled off since 2007, and emission intensity in the sector has declined. In 2015, total energy use in the transport sector was 57.6 TWh, and emission intensity was about 0.24 kg CO2-eq per kWh. Emissions from manufacturing have been reduced from 17.7 million tonnes CO2-eq in 1990 to about 9.8 million tonnes CO2-eq in 2015, a drop of about 45 %. This trend is a result of lower energy use combined with lower emission intensity (lower emissions per unit of production). Total emissions from manufacturing can be split into about 7 million tonnes CO2-eq of process emissions (see the box below) and 2.8 million tonnes CO2-eq associated with energy use. Total energy use in the sector including energy use for non-energy purposes was 90 TWh. The emission intensity of energy use for energy purposes was low, at about 0.032 g CO2-eq per kWh. This reflects the fact that electricity makes up a large share of energy use in the sector. The relationship between energy use and greenhouse gas emissions in a sector depends both on energy use and on which energy carriers are most widely used and the purposes for which they are used. For instance, about 70 % of emissions from manufacturing (7 million tonnes CO2-eq) and agriculture and fisheries (4.5 million tonnes CO2-eq) are process emissions. These emissions are from industrial and chemical processes rather than from energy use as such. In manufacturing, energy carriers such as coal, gas and oil are widely used in processes that make use of their chemical properties rather than their energy content. In the agricultural sector, there are process emissions from decomposition processes and livestock husbandry. The category ‘Other’ in the box above consists exclusively of process emissions from sources such as landfills and products containing fluorinated gases. In 2015, Norway’s greenhouse gas emissions from final energy consumption totalled 32.2 million tonnes CO2-eq, and process emissions accounted for about 14.3 million tonnes CO2-eq. The remaining 20.6 million tonnes CO2-eq was from energy use for energy purposes. Agriculture and fisheries combined are the third largest source of greenhouse gas emissions from final energy consumption. In 2015, emissions from the two sectors amounted to 6.3 million tonnes CO2-eq. However, most of this was in the form of process emissions. The remainder, 1.8 million tonnes CO2-eq, was closely linked to energy use, and the main sources were machinery, equipment and fishing vessels. Energy use associated with these emissions was 7.8 TWh in 2015, so that emission intensity was about 0.23 kg CO2-eq per kWh. This is a relatively high figure that reflects the widespread use of petroleum products in these sectors. These are the two sectors where emissions from energy use are lowest. Their combined emissions were just under 1.7 million tonnes CO2-eq in 2015. Their energy use came to almost 77.5 TWh, which gives an emission intensity of only 0.022 kg CO2-eq per kWh. Electricity, fuelwood and district heating are the dominant energy carriers in the household sector, which explains the low emissions associated with final energy consumption. In 2015, emissions from households were roughly 0.5 million tonnes CO2-eq, only about one-third of the 1990 level. Greenhouse gas emissions from service industries are low because electricity accounts for a large share of energy use and district heating is fairly widely used. In 2015, emissions from the service sector amounted to about 1.1 million tonnes CO2-eq, slightly less than in 1990. Emissions from service industries are low in relation to the value of production in the sector, and energy intensity in the sector (energy consumption per unit of GDP produced) is also low.